Guess what today's post marks? This post is my 100th post, oh my goodness I can't believe I have been posting this much since I started this blog in December. I wanted to make this post different, special, and above all a celebration of food. My sister-in-law Rachelle had wonderful suggestions: 100 ingredients for the recipe, a recipe that feeds 100 people, or a recipe that is only 100 calories. I decided my post would be a recipe that was first created 100 years ago. Let me share the cliff notes history version of this recipe. 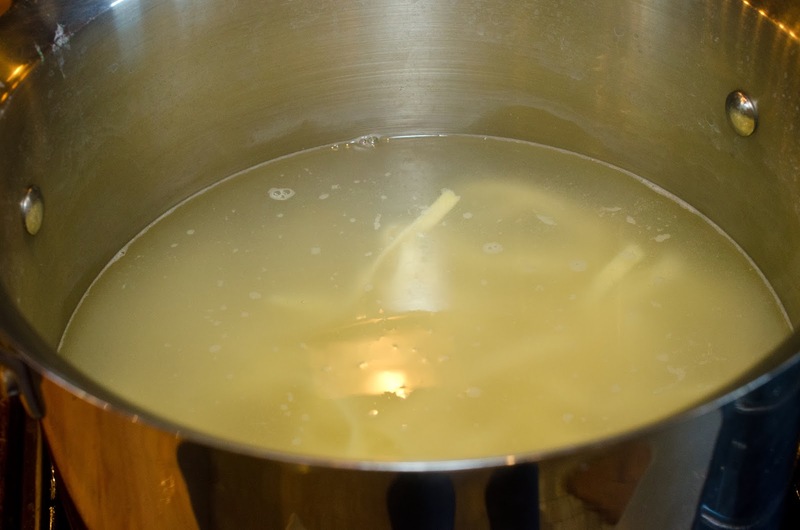 As you may have guessed, my recipe is Italian from the name and you most likely recognize some of the Italian words easily. The year was 1914 in Via della Scrofa, Rome a restaurant owner/chef named Alfredo di Lelio wanted to make a meal his pregnant wife could eat and enjoy. Ines di Lelio was pregnant with their second child and having horrible nausea. 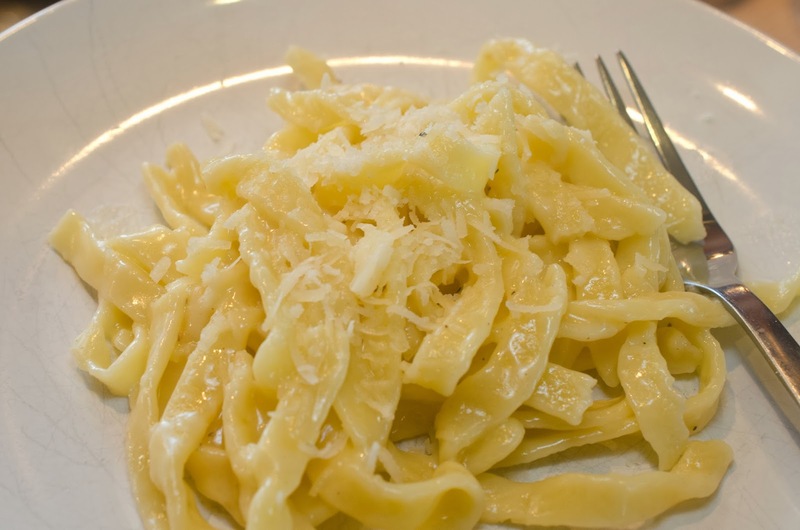 Ines enjoyed the Fettuccine Burro e Parmigiano so much she ate it regularly. 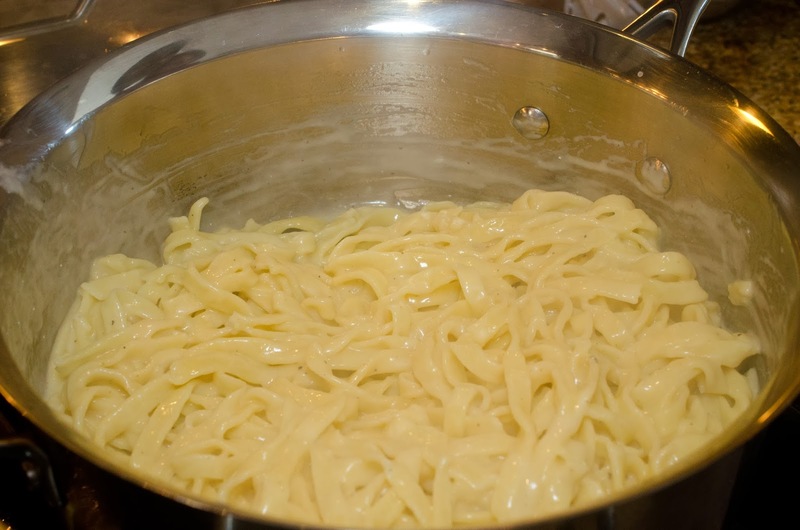 Alfredo's recipe is what we affectionately call Fettuccini Alfredo here in the USA. In honor of Ines and Alfredo's recipe, my friend's Siri, Bridget, Angela, and Whitney helped me make and enjoy this dish. Both Siri and Whitney are pregnant, so in a way we have truly come full circle with recreating the original recipe and circumstances (sort of, since my name isn't Alfredo, I don't own a restaurant, and we don't live in Italy, but other than that we're close). Thank you to my friend's for sharing in this foodie celebration. Doesn't it look so creamy and delicious? Ingredients for this recipe are: 1 lb. 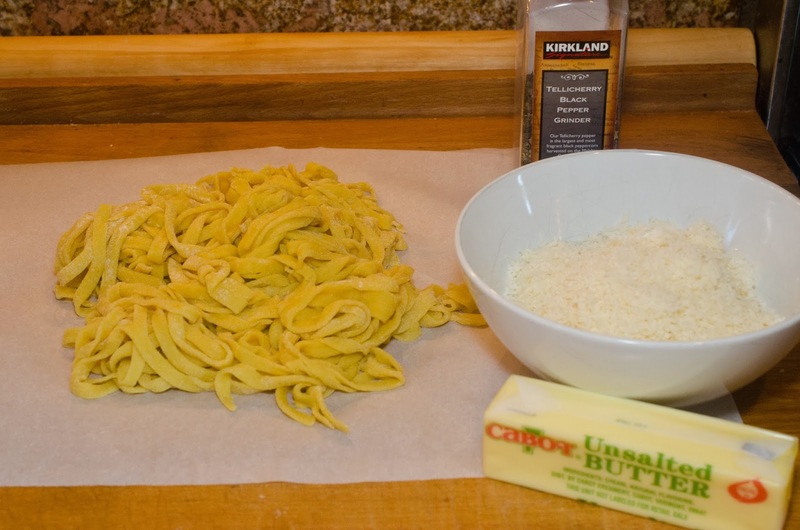 fresh or dry fettuccine (I used homemade, my recipe can be found here), 1/2 cup unsalted butter, 1 cup grated parmigiano, 3 tablespoons pasta water, and black pepper to taste. 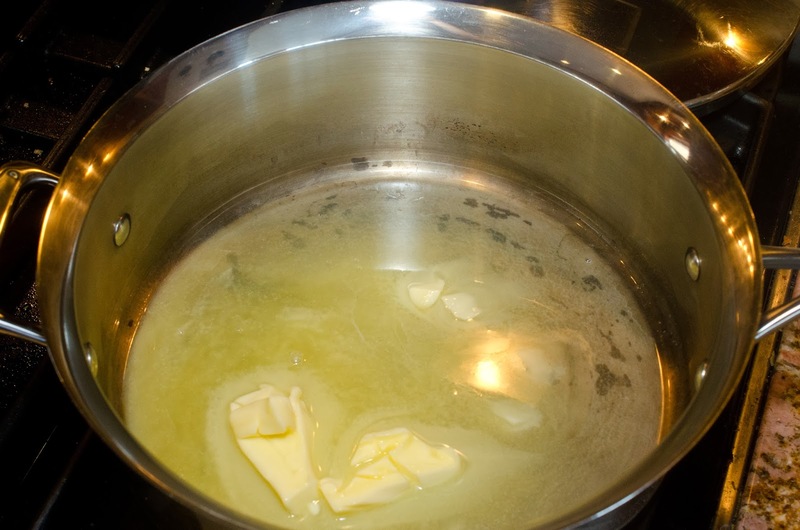 In another saute pan melt butter. 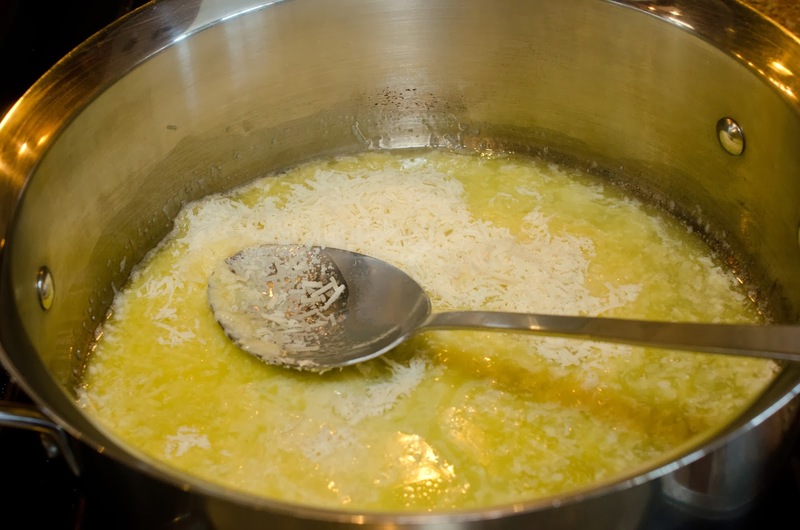 Add cheese, fresh black pepper, and the reserved 3 tablespoons of pasta water. 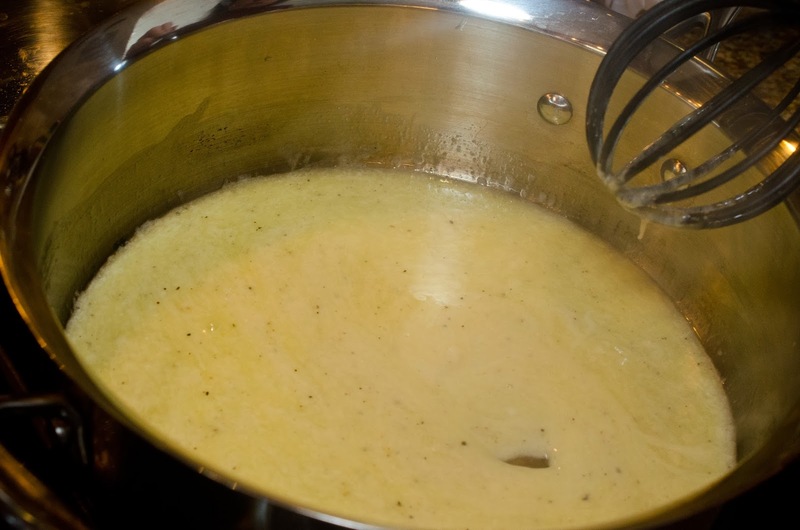 Whisk sauce until cheese has melted. Add pasta and stir pasta in sauce. at all heavy. My pregnant friends agreed this was a wonderful pasta recipe. Thank you Alfredo for creating a wonderful pasta dish for your wife and sharing it with the world. If you are interested in learning more about this recipe you can read about it here. Awesome. This is one of my favorite dishes, and I had no idea about it's history. Great 100th post Steph. I agree, great post. This is my all time favorite meal. The recipe I use calls for heavy whipping cream haha. Looks delicious, and so fun to learn tr history of it!